Deng Xiaoping was 74 years old when he took control of China. Although a long-time member of the political establishment, he changed the nation and began one of the longest periods of rapid GDP growth ever. The majority of Nigerian voters must be hoping that the 72-year-old Muhammadu Buhari will do something similar. Buhari has already done one thing that Deng never tried – win a democratic presidential election. His clear victory over incumbent Goodluck Jonathan is in itself a significant sign of progress. In a country deeply divided by religious and tribal loyalties, a northern Muslim managed to create an alliance that gained significant support from southerners and Christians. Jonathan’s prompt and gracious admission of defeat also had no precedent in the 55-year history of independent Nigeria. This is Buhari’s second stint at the top. When he took power before, on Dec. 31, 1983, he was a major general in a military government which had just suspended the constitution. His 20 months in office were marred by human rights abuses. But he displayed personal probity. There was also fiscal austerity– and small advances in dealing with the country’s many structural challenges. Three decades later, Nigeria has progressed, not least in moving towards democracy. But a host of political and economic problems remain. The country is still over-reliant on hydrocarbons. As in the early 1980s, there has been a sharp decline in oil prices, which is especially painful for a government that relies on crude for 70 percent of its revenue. Renaissance Capital expects a one-third decline in the government’s receipts in 2015. To this, add political and tribal struggles, entrenched corruption, and inadequate investment. The resulting widespread poverty does not necessarily bother the country’s elite. They are likely to resist reform and anti-corruption campaigns. Buhari can count on support from foreign investors, who have often been disappointed by the country’s weaknesses. As of March 31, the yield on Nigeria’s 2023 dollar bonds had fallen to 6.2 percent, the lowest since December. But it will take more years than Buhari has to get Nigeria firmly on the right path. He should remember that one of Deng’s most important accomplishments was to persuade his successor not to retreat. Supporters of the presidential candidate Muhammadu Buhari and his All Progressive Congress (APC) party celebrate in Kano March 31, 2015. 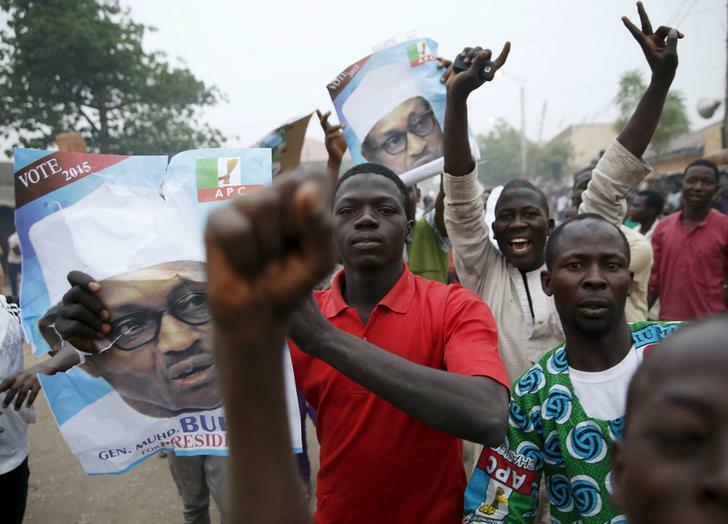 Muhammadu Buhari has been elected president of Nigeria, winning a commanding majority over incumbent Goodluck Jonathan. The latter called Buhari on March 31 to concede defeat. Buhari will take office on May 29, completing the first democratic handover of power since Nigeria gained independence in 1960.